BusinessReel is a search engine for business for sale listings.BusinessReel allows users to explore and discover the businesses for sale they never knew existed. 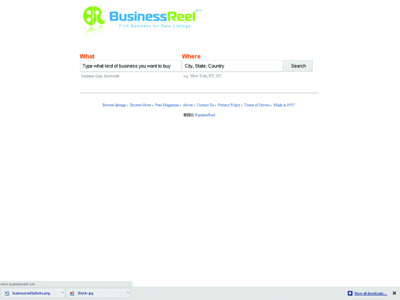 You can search for what kind of business you are looking to buy by using BusinessReel search engine. BusinessReel provides comprehensive filtering on what is important to each individual buyer. We leverage our unique technology to solve the businesses for sale search problem. Literally tens of thousands of listings from all over the web are brought together in one place so that you don’t have to search hundreds of individual sites to find what you are looking for. BusinessReel is constantly updated with new listings that are found across the internet. There are lot of businesses that are getting sold across the globe. The listings for businesses for sale are scattered on various sites on the web, but currently there is service that aggregates and let you search for these listings through a single interface. BusinessReel will do to businesses for sale listings what kayak.com did to travel fares. It provides a single destination for businesses for sale listings so that the buyers will be able to search for those listings with comprehensive filters, compare the listings etc.